Eleni was beside me making this with quilt rulers and crayons. And somehow, looking at both, I was hungry for this. Inspiration is funny. This is your window in to where design meets sugary marshmallow cereal. And crayons. Happens nearly every day here, actually. You've also been given the sneakiest peek of a very tiny portion of my newest fabric collection (which, yes, along with many features includes some solids!). I would call the new fabrics a family rather than a collection, as its varied, related, sprawling and non-stop on inspiration. Total reveal next week! For now, I need to exit the studio and clean house as we prepare for Roman's Baptism tomorrow and the 90 or so closest friends that will share it with us. Right after the triple-dunk festivities, I imagine I'll be right back to sample sewing for market, continuing work on 3 new sewing patterns, and wrapping up photography for book 2. Whew. Who wants to slow down with me? Me, Me! Looking forward to the big reveal AND most of all the new book! Love the way you photographed the fabric! I can't wait. I NEED new fabric!! 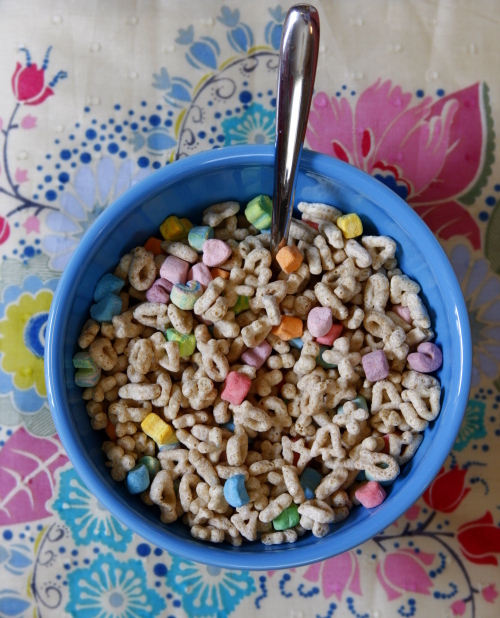 When I am pregnant, Lucky Charms cereal is my weakness (and, since I'm pregnant, I have to fight the urge like I'm a knight fighting a fire breathing dragon). Sadly, since my baby girl is sensitive/allergic to milk proteins, I can't have milk until she's done nursing, so I STILL can't have a little bowl of it. Someday I will get to torture my body again with the sugary colored bowls of goodness! VERY excited about your new fabrics and your new book! My last comment made it seem like I am pregnant again, I realize. Oops. I meant, "if I'm pregnant I have to fight the urge". ANYWAY! I love the sneakiest peek of that fabric! I can't wait for the new book too. WooHoo! I cant wait for your new fabric!! and your new book! and more pictures of that sweet baby!! I'm looking forward to the new fabric family but right now you've really got me with the marshmallow cereal. I'm at home with the flu and haven't eaten all morning and now I'm wondering if I could get my husband to make a quick stop at the grocery store on his way home for lunch. Looking forward to the great reveal of the whole line! YAY! Solids are awesome! My jaw just dropped with happiness - can't wait to see the new fabrics next week!!! The fabric up top is ohmygoodness beautiful! Can't wait to see your collection. Can't wait to see the newest fabrics! And the new book too! Gorgeous solids - and is the fabric under the Lucky Charms a new print too? I sure hope so - it's beautiful!! Can't wait to see the "family" all together! can't wait for the new fabric, I can't make up my mind for the "old" !!!!!! And may god bless your son with peace, health and happiness. Hope the baptism goes well - what a fun weekend! 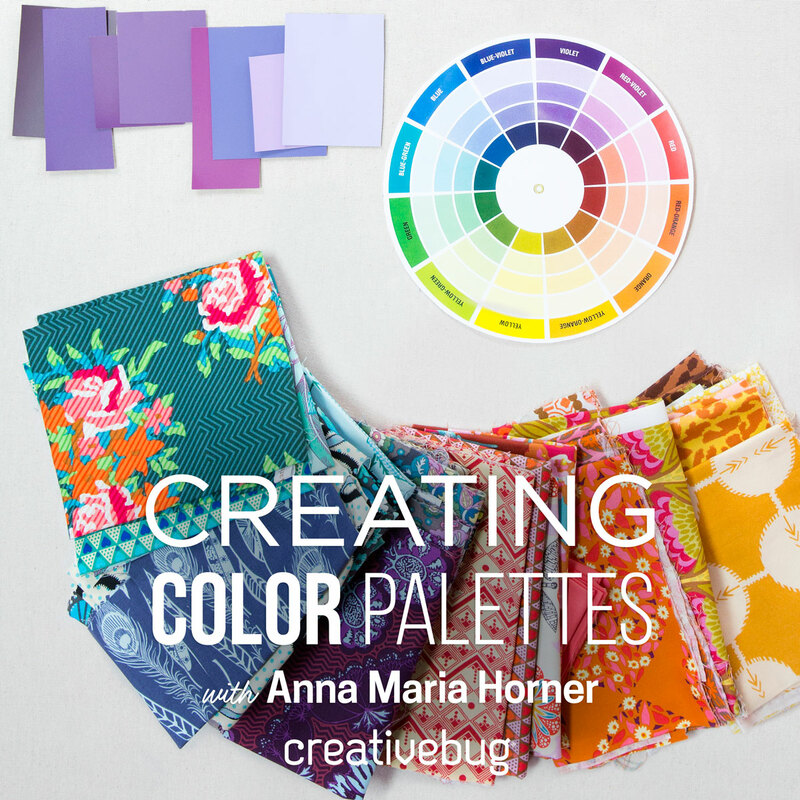 Can't wait for your new fabrics and book! I'm finishing my first quilt this weekend - all log cabin squares taken from the one in your Seams to Me book. Love it! I'm quite smitten with solids right now. Can't wait to see your new collection and thanks for including solids! OH!! Love the new print! Your good folks line reminded me so much of linens I'd see in my grandma's armoires in Austria, and it looks like this line mine have the same feel. YUMMY!! Me to kalo to onoma! Have a great time! P.S.I think we all love it when you feel inspired!LOL! It all seems terribly exciting to me. Enjoy your family. Two seemingly meaningless things to say: I have had undeniable, *magically delicious* cravings lately, and the fabric peek is so attractive and beautiful that my heart rate increased and I feel like a child in the cereal aisle ready to a throw a fit to get what I want. I want Lucky Charms and I want your new fabric. Now I am a wreck, but I forgive you. Oh how do you make the cute rose looking knot in the middle? Is it tied or made seperate and stitched on. So cute. Love the colors AMH , they look like melted icecream colors. 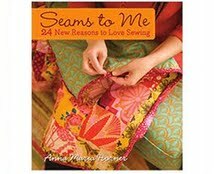 I love your seams to me book, I read it while i was flu-ish and in bed this week. Can't wait for the following act! The new fabric looks absolutely beautiful! I love the color palette and can't wait to see more. I love the new fabric and can't wait for the full reveal! You sound so incredibly busy and yet take time to notice the beauty around you and take inspiration from common things. Love that. Can't wait to see the new fabrics! Will there be any oilcloths in the new "family"? God bless your beautiful family as you baptize Roman. I love your work, your work is so inspiring, AND you have the coolest story of how it all began!!! I am 1 of 7 children (I am the middle child, 6 girls & only 1 boy!) He was definitely our favorite! Can't wait to see the full reveal (I'll be checking your blog daily....)!! Loving the new sneak peeks & can't wait to see the reveal! Wishing I could make it to Market this fall to see the samples--drat. You'll post photos for the over-committed, won't you? Out of pity/comisseration? 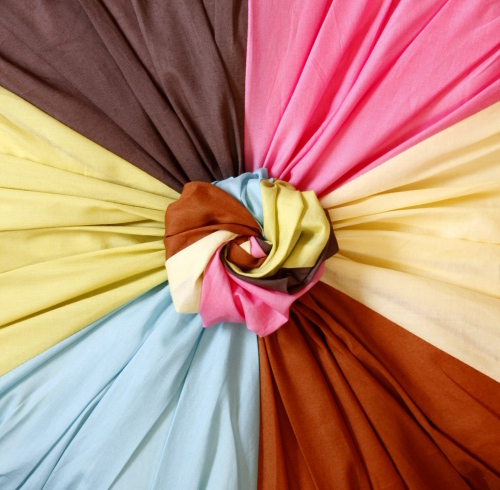 excited for your new fabrics, and I have been especially interested in doing more with solids lately -- so perfect! Can't wait to see more! I love that print! Do you know if Textile will be ordering the whole line? I had a booth at a small market a couple of weeks ago and a Westminster rep was there with a rack FULL of your fabrics! Oh it was heaven! Your fabrics are just beautiful and they FEEL wonderful! I look forward to seeing the rest of the new line, maybe even in real life at the Texas market...I hope that works out! Oh my gosh, I love the fabrics! Enjoy a wonderful family celebration, as you know that's really what its all about! I just discovered your beautiful fabrics and purchased "Seams to Me". I am excited to make something, even though I don't sew very well. What an intriguing photo! I cannot wait to see what you have created in this quilt! 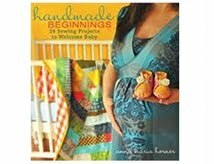 I am so thrilled for the new book and new line of fabric! 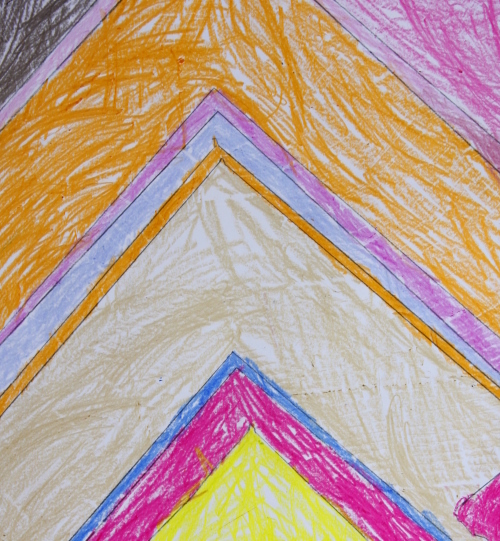 It looks like an eye for design runs in your family. I am so looking forward to the reveal!! Now I am hungry for some Lucky Charms cereal. What is it about those wonderful colored marshmallows and the frosted crunchy bits? Mmm! I can't wait to get a proper introduction to the new family! It's going to be wonderful!!! psst...hey AM...just saw a shower curtain made from your Drawing Room stash on p22 of the latest issue of Ready Made. had to stop and check in ;) love this post!! Wow, Solids! It is sooooo hard to leave blank spaces, isn't it? The colors look lovely though. oh wow, i am already trying to figure out how to use what I have and now there is more... love it so far and can't wait for the reveal! Anna Maria, congratulations on so many levels! Chronia Polla for the newly illumined, and BRING ON THE SOLIDS!!! Many, many congratulations for your baby's baptism. In Spain we say that each new born child comes with a loaf of bread under his little arm, yours comes with a new fabric collection (already creative!). Can't wait to see what you have in the works....and I'm all for slowing down with you! i bought some of your fabric today for the first time. and i am so happy about it. :) the elderly women at the quilt shop....bless their hearts...called you Ann Martin? whatever. i just nodded. i asked if they had anymore of your fabric and she said "No." i thought that was weird....and sure enough they had much more "ann martin" ha ha ha. What a fun and inspiring post! Chronia Polla today, little Roman! That totally cracked me up. 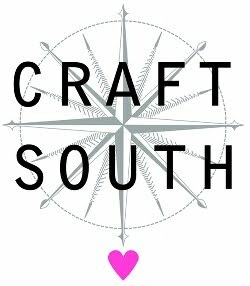 ok, I just want you to know that I am haunting, HAUNTING your blog, let me tell you....tempted by that little peak of new gorgeousness! Please say it will be soon? Please don't tease us like that! It's been ages since you promised the reveal. Okay, well almost two weeks but it feels like ages! I just thought I'd drop you a quick message to say I've just taken delivery of you Good Folks fabric bundle and it's beautiful...it arrived in the post on Friday and I can't wait to get started with something crafty. Anna Maria, Where are you? We miss you SO!! I just found your blog after having bought your breathtaking fabric thinking that I was having my first baby girl. Turns out, it's a boy, and back to the drawing board. Just means I've got lotsa pink fabric to make something for myself. Loving your work... just subscribed to your blog. You may have not intended to do so, but I think you have managed to express the state of mind that a lot of people are in. The sense of wanting to help, but not knowing how or where, is something a lot of us are going through. Please come visit my site Dallas Texas TX when you got time. You may have not intended to do so, but I think you have managed to express the state of mind that a lot of people are in. The sense of wanting to help, but not knowing how or where, is something a lot of us are going through. Please come visit my site Dallas Yellow Page Business Directory when you got time. Very cute fabric and I love the bowl of cereal.. a real visual pleasure.. Oh...I love that knotted fabric! That is so ingenious!! I just love it ..... well i don't have any doubt about your articles... your articles are awesome... Honestly you are simply the best.Thanks for sharing this with us. Please come visit my site Oakland Phone Book when you got time. I just love it ..... well i don't have any doubt about your articles... your articles are awesome... Honestly you are simply the best.Thanks for sharing this with us. Please come visit my site Oakland Business Services And Classifieds when you got time. What a blog filled with vital and important information this is .. It must have taken a lot of hours for you to write these yourself. Hats off from me for your hard work. Please come visit my site Fresno Yellow Page Business Directory when you got time. That is some inspirational stuff... Never know that opinions could be this varied. Thanks for all the enthusiasm to offer such helpful information here. Please come visit my site Phone Directory Of Sacramento City California CA State when you got time. Wow! Thank you! I always wanted to write in my site something like that. Can I take part of your post to my blog? Please come visit my site Jacksonville Yellow Page Business Directory when you got time. I usually don’t leave comments!!! Trust me! But I liked your blog…especially this post! Would you mind terribly if I put up a backlink from my site to your site? Please come visit my site Indianapolis Yellow Page Business Directory when you got time. Hello, What enticed you to post this article. It was extremely interesting, especially since I was searching for info on this subject last Thursday. Please come visit my site Phone Directory Of Arlington City Texas TX State when you got time. Hello, What enticed you to post this article. It was extremely interesting, especially since I was searching for info on this subject last Thursday. Please come visit my site Arlington Business Search when you got time. Couldn't be written any better. Reading this post reminds me of my old room mate! He always kept talking about this. I will forward this article to him. Pretty sure he will have a good read. Thanks for sharing! Please come visit my site City Guide Santa Ana when you got time. Couldn't be written any better. Reading this post reminds me of my old room mate! He always kept talking about this. I will forward this article to him. Pretty sure he will have a good read. Thanks for sharing! Please come visit my site Santa Ana City Business Listings when you got time. And if take the second must refuseA heavenly mansion ,raging in the dark.